Publisher: New American Library, 2007. New York. “My interests as an author usually lead me to stories of heroism and sacrifice that went unrecognized for too long, and the story of Operation Halyard fits the bill perfectly. I was drawn to the idea that not only was this an amazing tale of intrigue and bravery, but it had been purposefully hidden from the American people for decades. A dramatic story is one thing; a dramatic story that has been kept secret is even more intriguing. There are men who fight for their country who are truly a personification of dedication, determination, courage and heroism. Some of them we come to know, and their names are immortalized in our historical consciousness. There are others who most people never hear of and their deeds never become legend, though they deserve to be known and remembered and permanently included in the historical record. 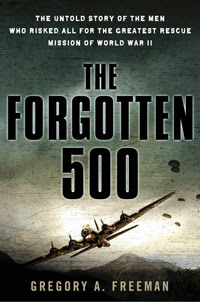 The Forgotten 500 by author Gregory Freeman is a new and important book that not only introduces the public to such men, but explains why they and their rescuers deserve a prominent place in history. This book is a celebration of human fortitude and integrity and is so much more than just another book about World War Two. ‘Heroes’ has become an all too common term in this day and age, to the point that heroism has become trivialized. Gregory Freeman reminds us what true heroism is really all about, the kind of heroism that can, and should, leave us in awe. He doesn’t just tell us, he shows us. That would have been enough to make this a valuable book in any library, but Freeman strove for more and has accomplished it. He was bothered by the fact that these heroic acts that he had discovered had not only been virtually ignored, but were actually deliberately suppressed as if they never happened. His research led him to painful discoveries that he could not help but include in this story of heroism, and the light that he sheds on the dark side of ‘Operation Halyard’ makes The Forgotten 500 not only a valuable book, but an essential one. Just as he reminds us of the great things that men in the worst situations are capable of, he also exposes the lengths taken to cover up acts that should have been widely heralded as triumphant examples of the human spirit but instead were sacrificed to the manipulations of political expediency. We owe both the dead and the living to move, once and for all, ‘Operation Halyard’, possibly the greatest rescue of American lives from behind enemy lines in the history of warfare, from being a mere footnote in history to being a shining example of what men of integrity are capable of. Mr. Freeman, with The Forgotten 500, is paying the long overdue debt. During the second half of World War Two, hundreds of American airmen were sent on dangerous missions over Europe during which their job was to cripple the oil production that was feeding the Nazi war machine. Freeman describes in vivid detail the nature of these missions and by tapping the memories and experiences of the airmen and faithfully capturing them on the pages of The Forgotten 500 he paints a graphic picture of what was endured by these patriots who did their job and followed their orders regardless of the retaliation that was sure to follow. These missions would cost many of their lives. Those who survived the Nazi retaliations had to bail out of their planes over foreign territory in order to get a shot at survival and they did so, not knowing what their fate would be. Their desperation landed them in the hills of Yugoslavia, mainly in Serbia, enemy occupied territory that was, luckily for them, also the land of General Draza Mihailovich, his Chetnik forces, and the peasants who were loyal to them. When they landed in the hills and forests of Serbia, the airmen were now among freedom fighters, loyal above all else, to the democratic Allies, though they did not know it as they fell. Among the hundreds who fell, most were Americans. Once on the ground these men were soon found by the Serbian peasantry and it was these strangers who spoke a foreign language on foreign soil who would shield them, soothe their wounds, feed them, house them, and protect them, even at the sacrifice of all that they owned and even their lives. The fallen airmen would soon learn that their benefactors were acting on the orders of General Draza Mihailovich, the Serbian hero, who in the beginning darkest moments of the war, had been heralded as being a legendary warrior for the whole free world, but who, in recent times, had been abandoned by the very democracies to whom he had been so loyal. Though he had been abandoned and left to the wolves, both the Yugoslav communists who were bent on destroying him and everything his organization stood for, and the Germans who continued to view him as their primary enemy in Yugoslavia, Mihailovich, upon learning of the fallen airmen, gave out the order to do whatever necessary to protect them, heal them, and in the ensuing months, evacuate them to safety regardless of the cost to himself. This man, whom the airmen had been told to avoid, would end up being the man who would save them. In cooperation with American OSS personnel, whose struggles and ultimate triumphs are faithfully recorded by Freeman as ‘Operation Halyard’ came to fruition over the course of 1944, General Mihailovich and his forces would prove just how profound ‘doing the right thing no matter what’ is. Though this story has been competently tackled by other historians and authors genuinely interested in doing justice to the events of 1944 in enemy occupied Serbia, this story has never been appropriately publicized in the western world because it has not been “politically correct” to do so. It has remained a taboo theme in many political and publishing circles which has dismayed and frustrated so many of the veterans of ‘Operation Halyard’, both the rescued and their rescuers, for decades. Many spent the duration of their postwar years striving to right this wrong. Many have since passed away without ever experiencing the contentment of seeing justice done and a debt repaid. Mr. Freeman and his publishers, with The Forgotten 500, may well be the catalyst for finally changing all of this. When one becomes familiar with the obstacles that have been pervasive in getting this story told over the last six decades, one cannot help but appreciate the courage and the fortitude that it took to produce and publish this book. As much as I admire Freeman’s talent for telling a great true story as it deserves to be told and for his attention to detail that makes this story come alive on the pages, I admire his publishers even more. Instead of dismissing this story, they have chosen to bring it out in the light, thus vindicating all of those both on this side of the world and on the other who lived this story. The heroic details of the bombing missions and the subsequent bailouts over enemy occupied territory and the great rescue evacuations that followed in 1944 are the “easy part” of this story. Author Freeman didn’t settle for the easy part. In The Forgotten 500 he delves into the more complicated tangential issues that cannot be ignored in the telling of the story of the Halyard Mission. A primary such issue is that in the name of political expediency, enforced by both the Yugoslav postwar regime and the British, the Americans stayed silent about this chapter of the great heroism of their own sons and the selfless sacrifices of their rescuers. Not only did they stay silent, they kept it silent. Classified. Another difficult issue that Freeman addresses is the abandonment of General Mihailovich by the Western Allies to whom he had been so loyal. British spies and traitors, such as James Klugmann, had a role in the story that was pivotal, even though he was not directly involved in ‘Operation Halyard’. It takes an astute researcher to piece together the relevant collateral elements of the ‘Halyard’ story that make the deeds of the rescuers all the more extraordinary. Freeman clearly did his research in piecing together the often convoluted chain of events that led to the Allied abandonment of Mihailovich. For that, any serious student of World War Two history should be grateful. James Klugmann, a devout communist and ultimately a traitor to his country of Great Britain, is among the many collateral players in the Mihailovich story and Freeman doesn’t shy away from exposing his role in influencing the misguided British policy that would have tragic consequences for General Mihailovich and ultimately the fate of Serbia itself. It was Deakin who was mainly responsible for convincing Churchill to switch sides from Mihailovich to Tito. In this endeavor he was greatly supported by Fitzroy Maclean, who became the chief of the British mission at Tito’s headquarters. Freeman explains who these people were and just how strongly they influenced the disastrous British policy in Yugoslavia during the war. The author could have determined that this was all material for another separate story, but he chose to include it in this one, The Forgotten 500, because he understood from the very beginning that there was more to ‘Operation Halyard’ than met the eye. He competently weaves politics and the story on the ground together in such a way as to give the reader the big picture. Freeman, unlike many historians, is able to see the forest, not just the trees. He understood, too, the significance of Mihailovich’s integrity in rising above and beyond the betrayal perpetrated upon him and his people. In the summer of 1944, because of destructive but successful British political manipulations, it was no longer ‘politically correct’ for the Allies, including the Americans who deferred to the British in policy relating to the Balkan sphere, to deal with Mihailovich in any way. Yet, there were now hundreds of downed Allied fliers, most of them Americans, who were being protected by Mihailovich and his men and had to be evacuated. This presented quite a political dilemma. Thanks to the efforts of American officers such as George Vujnovich and George Musulin, an ACRU organization (Air Crew Rescue Unit) was created and it was decided to send Musulin to the hills of Serbia, accompanied by Mike Rajachich and OSS radio operator Arthur Jubilian, to run the evacuation operation that would come to be known as the ‘Halyard Mission’. It was going to be a rescue attempt unlike any ever attempted by the OSS or anyone else, and indeed that’s exactly what it turned out to be. Over the course of several months in 1944, hundreds of Allied airmen would be evacuated and not one would be sacrificed. All, without exception, would make it back to their homes and their families alive. Not one American would be turned over to the Nazis, even though the Germans were offering substantial rewards to the local natives to give them up. Though the Allies had turned their back on General Mihailovich, he refused to turn his back on them. Gregory Freeman describes the evacuations in vivid detail and with the due well-deserved respect that is appropriate given the magnitude of the obstacles that were faced, both politically and on the ground, to make Halyard a success. The reader is put in the middle of it all as an observer and the reader cannot help but wonder how it was possible to keep such a magnificent true story in the darkness for so long. The reader will also be struck by the irony of the concentrated attempts that were made by Allied officials to sabotage this rescue operation, a rescue operation that was intended to save the lives of their own boys. In The Forgotten 500 Gregory Freeman makes sure that the irony is not lost on the reader. “Musulin, Rajacich, and Jibilian soon realized that the British were not just unenthusiastic about the mission. They were actively sabotaging it, or at least that’s how it appeared to the American team. The outright hostility of the British was made evident on the next attempt to jump into Pranjane, a few days later. Musulin learned that on the first attempt, when there were no ground signals, the problem actually was that the pilot had flown to the wrong coordinates. They were in the wrong place, so that explained why there was no welcoming party. Knowing that, Musulin wanted to double-check the coordinates soon after they took off on their third attempt to go rescue the airmen. He went forward and asked the pilot to confirm their destination. The pilot read out the coordinates he intended to take the men to and, as soon as he checked the spot on his own map, Musulin exploded in anger. ‘That’s Partisan territory!’ he yelled. ‘Where the hell did you get those coordinates? They didn’t give up, however, and eventually, everything was in place, despite the obstacles, and the series of evacuations would proceed. Success, pure and complete, was achieved. I highly recommend The Forgotten 500, not just to my American and Serbian friends, but to anyone interested in historical accounts that are not tarnished with propaganda, lies, and political correctness. I also recommend this book to anyone who is inspired by a great story about great people who did great things. Those of us who know the “Halyard” story and its significance will smile with satisfaction. We should, indeed, be pleased. It’s about time. I've just received my copy from Amazon...great book!